In a world where new five star hotels pop up all the time, vying to out-luxue one another by dint of either their sheer scale, or the happily infantilising world they present, Belmond Le Manoir aux Quat’Saisons remains the benchmark after three decades. Under the ever-present and curatorial eye of superstar chef and patron, Raymond Blanc OBE, the beauty is in the detail here. Upon arrival at the pretty Oxfordshire village of Great Milton, guests are ushered into a log fire-warmed reception by staff who ooze charm, warmth and competence. Despite being perennially fully booked, everyone takes care to know guests by name, whether first-timers at the legendary hotel, or Le Manoir old hands. But then it makes sense; Monsieur Blanc has won Michelin stars throughout his life (the hotel’s restaurant has two) – and you don’t achieve the highest gastronomic accolades without insisting on perfection. In Le Manoir, Blanc – justifiably perceived as the chef’s chef – has created a little bubble of perfection, where the quality of service and levels of comfort run through every detail, and match that of the famous food. As he says when we bump into the great man, “A great dinner is nice. But it is service that you remember forever.” It’s a maxim that has stood him well, ever since he opened his impeccable hotel here in 1984. 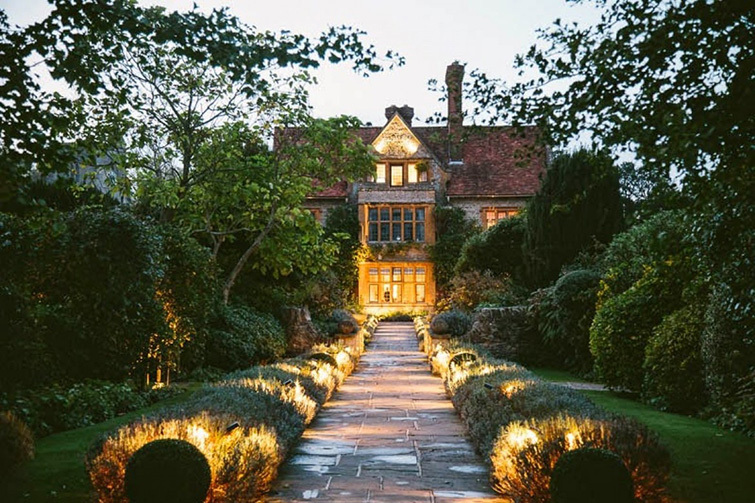 There are 32 bedrooms, including 16 suites, at Le Manoir, each of which is different and meticulously presided over by the great man, Monsieur Blanc himself, along with top designer Emily Todhunter. It stands to reason that one celestial room should be labelled Blanc de Blanc – so white is it that driven snow could not live up to its purity – but on our stay, we are shown to the equally heavenly Lemongrass. 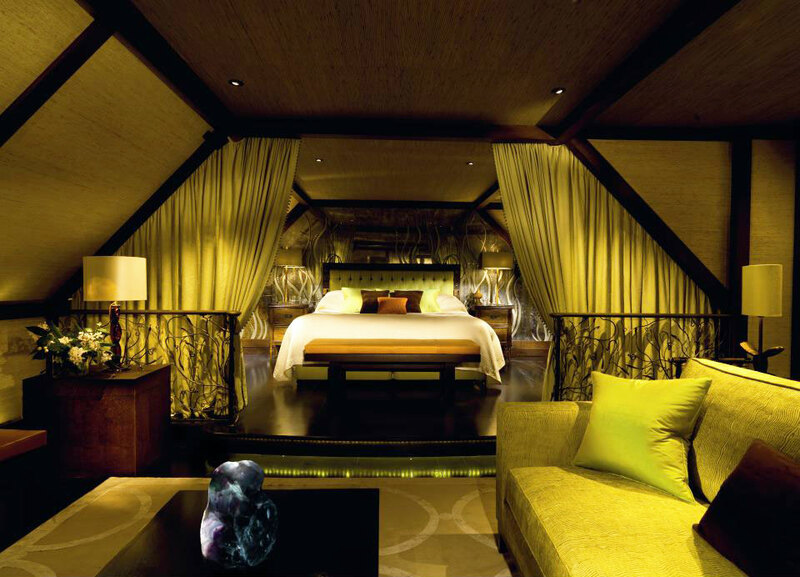 Housed in the carefully designed extension, it is a deluxe studio suite inspired by old-world Asia, its lime-greens cutting through the sultriness of the dark bamboos. Our favourite features? Almost too many to choose from, but they would have to include the wood-panelled dressing room, reminiscent of Orient Express-style old world charm; the irresistible chocolates and lavish fruit plates, to say nothing of the decanter of Madeira; the tank housing exotic fish that acts as a screen between bedroom and bathroom; the ambient lighting that guides your path, turning on as if by magic; and then there’s the sauna, which could comfortably seat six. The level of luxury is gloriously, utterly, wonderfully absurd. Not a mere pretty oasis for a post-prandial parade (though they are that too), the beautiful gardens are central to operations at Le Manoir. 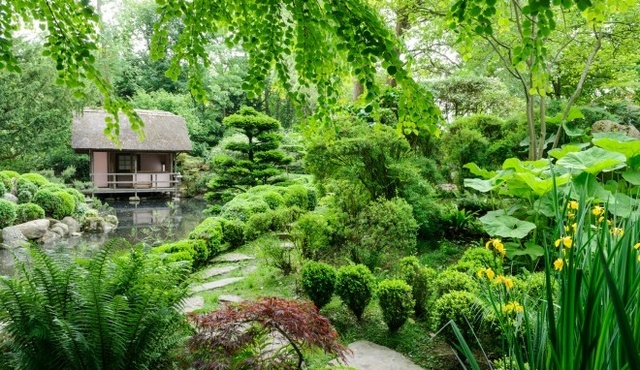 Each garden tells its own tale, from the resplendent 15th century ponds and the manicured Japanese garden (complete with tree planted by Monsieur Blanc and the Japanese ambassador in 1994), to dotted sculptures, a wild mushroom patch and a bountiful and impressive greenhouse. What is grown on these eclectic grounds makes its way daily into the kitchen, helping to form the basis of the seasonal ingredient-led, sensational menu. On our pre-Christmas visit, a turn around the gardens was made all the more spectacular by the twinkling of fairy lights in the Christmas trees. Sigh. 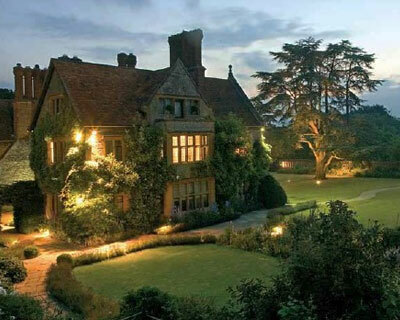 The restaurant at Le Manoir needs little by way of introduction. But an introduction to dinner is most certainly where we must start – and with a pre-prandial glass of vintage Laurent-Perrier by the log fire in the salon, no less. Attentive but genuinely friendly waiters come to deliver amuse-bouches and menus, and finally usher us through to the conservatory for our seven-course repast, the menu découverte. And what a repast; the seven courses – ordinarily, enough to make us dread the post-feast food coma – are light, exquisite, perfectly balanced and exude deceptive simplicity in the way that only the very best chefs can do. Handily, there are 50 such geniuses operating in Le Manoir’s kitchen under the watchful eye of Blanc and his head chef Gary Jones. We start with roasted pumpkin soup with seared langoustine, washed down with a glass of Lanius 2013. Presented in a little shot glass, it is winter in a gulp, and the rich goodness of the raw ingredients are testament to what’s grown in Le Manoir’s gardens; earlier that day, we spied the biggest pumpkin we’ve ever seen. Now, we have the pleasure of devouring it. Next up, a confit of oak-smoked Loch Duart salmon, pickled cucumber, watercress and potato is light, succulent and delicious. It slips down, and away, almost before we’ve noticed it. This sets the tone for a memorable meal; the very best and freshest ingredients, served simply and without fuss, but with the greatest of skill. The ever-changing menu makes good use of seasonal ingredients, so we enjoy hen’s egg with wild mushroom tea and autumn truffle, roasted loin of venison with celeriac and spiced monkfish with mussels and saffron. And how we enjoy them. Every mouthful, every nuance makes us believe that we have at last arrived in a culinary Kubla Khan. As we savour the last couple of courses of our dinner – a sumptuous deconstructed tarte tatin and coffee panna cotta with chocolate ganache – we notice several things that aren’t supposed to happen in restaurants of this calibre. There is no dress code, so well-to-do couples in jackets and pearls are equally matched by diners in more casual attire. And there is a great spread of ages and generations, ranging from the elderly couple on our left who have the civilised air of old money about them to the young family giving their sweetly curious daughter an early taste of gourmet cuisine. One hopes that she will become, as they say, to le manoir born.